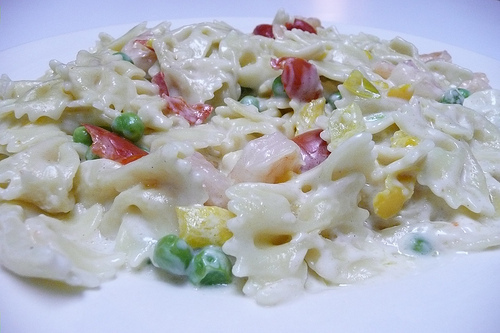 This post is filed under Alfredo, Birds Eye, Bowtie, Frozen, Microwave, Pasta, Peas, Red Peppers, Shrimp, Yellow Peppers. That looks like a pretty decent meal. I’d say the colors are a little more vibrant on the box but that’s it. Would you consider adding prices to your write-ups? I always way how impressive a product is (or how much I’d be willing to try it) based on looks, quality, etc. to price ratio. Regarding the photography issue, if you’re using a dSLR you could go with a cheap polarization filter. Since you asked… Your photo feels like you shot it under the fluorescents on your kitchen ceiling. Fluorescents have a pretty deficient color balance, which is what gives food that nauseating gray-green look. To get the look they have on the package, you need a fairly large, diffuse (full-spectrum) light source placed 18-24″ above the plate and slightly behind. This will let the light wrap around the food and balance out the glare from the sauce. There are also some hard kick lights on the sides to raise highlights along the edges of the pieces of food and some fill cards to open up the underside of the plate. (I should admit here that I used to be a commercial photographer, and I’ve done my share of food photos.) Hope this helps, but it’s probably more than anybody needs to know. Polarizing filter, flash diffuser, or bouncing your flash should all work. So, it is enough to feed 2 hungry people? 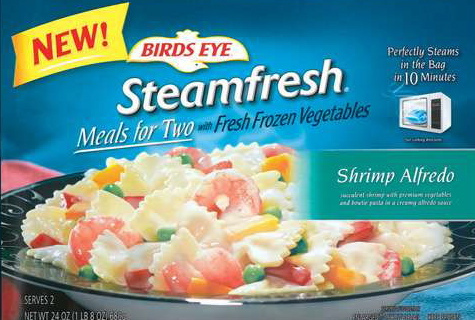 “Fresh Frozen Vegetables” – genius. RE. So, it is enough to feed 2 hungry people? Tips for reflective sauce – do you have one of those tents? If you have trouble, most food photographers use either a light distributing white tent, or diffusers on their lighting like umbrellas, or the best option, and most commonly used option: NATURAL lighting! Nothing beats it! It makes food look good! If you’re serious about this blog, you can buy one of those light tent kits, they come with lights, too. where can we purchase this product? Walmart has discontinued carrying it.